You are here:Home » Blog » Locals Guide to Byron Bay » Fisherman’s Paradise! 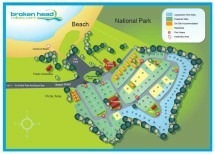 School holidays are here again and what better way to enjoy them by coming to Broken Head Holiday Park. These school holidays we shall be having a blast. We have got lots of activities happening these holidays to keep everyone entertained. We shall be having colouring in competitions and activity books for the kiddies with some great prizes up for grabs. Friday the 1st and the 8th we shall be having sausage sizzles for all our lovely guests. For all you fishing fanatics as we are right on the beach don’t forget to pack your fishing rods as the fish are running wild at the moment. All the residents in the park have been catching salmon, black fish, brim and tailor. 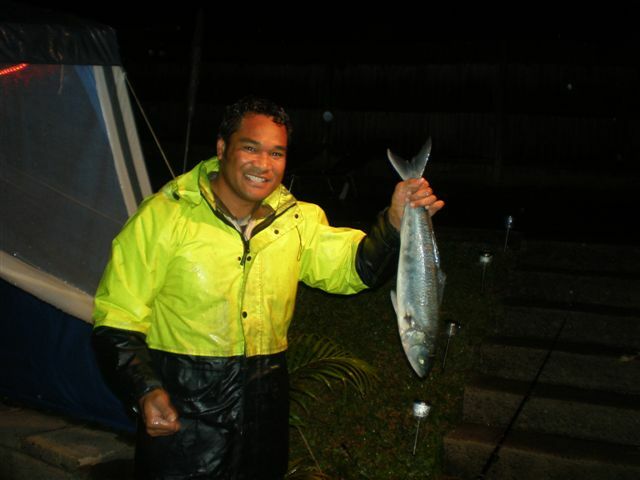 And the best thing is 9 out of 10 people are catching fish. Just ask our friendly staff where the best place is to catch the fish. Also, a must for the family is whale watching. As the surf is not too big we can see all the cute whales and dolphins having a fun time in the bay as they cruise on up the coast. So what are you waiting for??? We still have sites and cabins left and don’t forget, if you call up to make a reservation for 3 nights or more, we can give you off peak prices. Pictured is the on-site manager Chris catching his salmon.